Although you should never let strict formulas keep you from finding the right balance of page margins to printing area, they can provide a convenient starting point. Use these guidelines to create page margins with perfect proportions, then tweak them as called for in your publication. Roughly based on some of the formal canons of page composition in book design such as those espoused by J.A. Van de Graaf and Jan Tschichold, the steps below are less precise and applicable to a wide range of single page to multiple page publications. For a more in-depth look at page design and margins for books as well as other documents, see the additional resources at the end of this article. 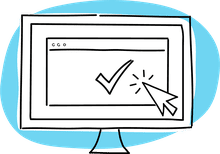 Margins create white space, frame the content of your page, and provide space for holding the page (and taking notes) without interfering with the text. Don't use the same page margins on all sides. For best appearance, size page margins progressively from smallest to largest: inside margins, top margin, outside margin, bottom margin. Make inside margins smaller than outside margins. When setting margins for facing pages, make the inside margin half the size of the outside margin. If the inside margins were the same then the space between pages (the gutter) of the spread in a book or magazine would appear excessive. Cutting them in half visually creates more even margins on left and right. However, this can also depend on the type of publication. For some booklets and books, for example, it may be necessary to create larger inside margins to compensate for the portion that is lost in the binding process. After accounting for creep and binding, the inside margins may appear to match the outside margins. Discuss this with your printing service. Use a larger bottom margin. Make the top margin half the size of the bottom margin. Page numbers and footers generally appear outside the margins which balance out the larger bottom margin. Make inside margins smaller than the bottom margin. The inside margins of facing pages would be one-third of the bottom margin. Keep outside margins smaller than the bottom margin. Make the outside margin two-thirds the size of the bottom margin. Use the same left and right margin on single pages. With a standalone page, the side margins would be equal, both at two-thirds of the bottom margin. Use these formulas as guides, not absolutes. Tweak your margins. After achieving the perfect proportions, make any necessary adjustments to the page margins to fit the desired look and feel of the piece, to accommodate binding, and to fit any other page layout requirements. It doesn't have to be mathematically perfect to look good. Larger margins with these perfect proportions tend to create a more elegant aura. They are appropriate for many formal layouts and for advertisements that wish to convey a sense of elegance. Smaller margins allow for more content, can create a sense of informality or even urgency. In some types of publications, such as many paperback books and newspapers, smaller margins are the norm and readers may find more expansive margins to be odd or even uncomfortable. Avoid using the same margins on all sides of a publication. Varied margins are usually more interesting. Of course, there are always exceptions. Some magazines and newspapers use uniform margins to good effect. Papers that use APA, MLA, or other style guides have specific requirements for margins such as 1-inch margins for MLA. Always refer to those guidelines when preparing term papers and other manuscripts that require a specific format. 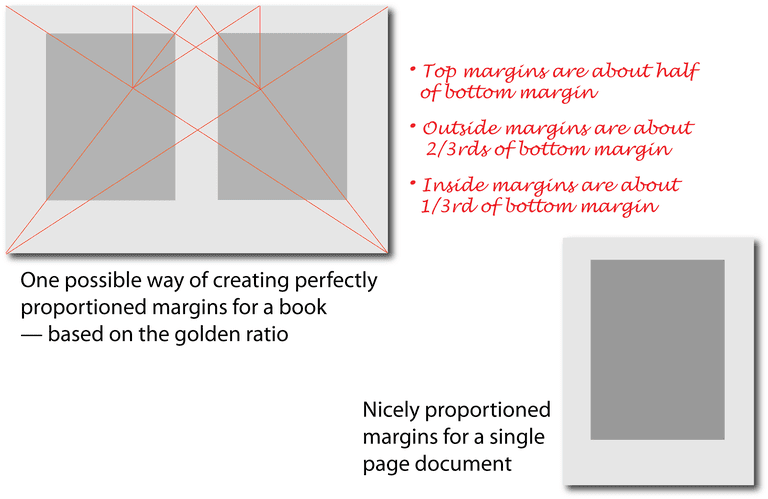 Book Design Basics Part 1: Margins and Leading describe and illustrate some common canons basing the margins on the golden ratio. Magazine Designing: Page Margins not only describes the role of margins and offers advice on creating them but includes the names of various margins such as back margin and head margin. Help! The Typesetting Area is a PDF that contains a close look at the use of the golden ratio and page proportions for creating margins and the area of the page to contain type. What Is a C-Fold, and How Are They Used to Design Brochures?